The Urban Land Institute (ULI) conducted an Advisory Services Panel regarding the Stitch vision plan to "cap" I-75/85 in Downtown Atlanta. The Panel provided expert, multidisciplinary advice on the complex land use and real estate issues related to realizing The Stitch. The Panel's work is aligned with ULI and the Trust for Public Land's "10 minute Walk Campaign" aimed at building healthy places. The Panel presented their findings and recommendations during a presentation on Friday, March 1st. The presentation was live streamed via the Atlanta Downtown Facebook account and that video is available here. A complete and formatted report will be available in a few months. Central Atlanta Progress/Atlanta Downtown Improvement District (CAP/ADID) have developed an initial concept design study for a new ¾-mile platform that spans the I-75/I-85 Downtown Connector and ‘stitches’ Downtown back together. 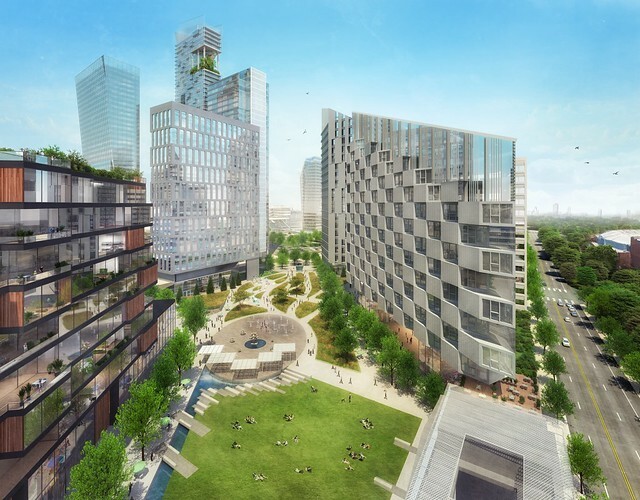 The concept, appropriately called “The Stitch,” proposes to reclaim approximately 14 acres of new urban greenspace atop a new platform structure spanning the Downtown Connector from the Civic Center MARTA Center at West Peachtree Street to Piedmont Avenue. While Atlanta is not unfamiliar with viaducts and reclaiming urban space over transportation infrastructure, The Stitch is unique in its scope and opportunity. The roots of The Stitch date back to 2001 and plans for a new “Mayors Park” to honor mayors Maynard Jackson and Ivan Allen Jr. 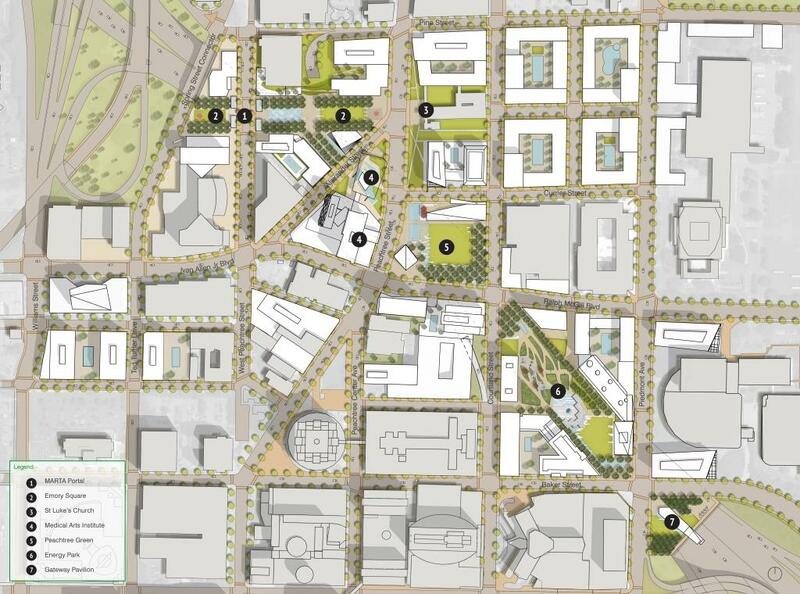 In the subsequent years, the initial vision and proposals evolved through CAP/ADID’s Imagine Downtown Plan, an Urban Land Institute Center for Leadership Technical Advisory Program analysis, and the I-75/85 Connector Transformation vision plan. Building on the momentum of these studies, CAP/ADID funded and contracted with Jacobs to develop The Stitch Concept Design Study. Now, CAP/ADID is excited to be furthering its evaluation of this ambitious concept with the assistance of DaVinci Development Collaborative to test the feasibility of the plan and develop a roadmap for implementation. “Cap” the I-75/85 Connector at Peachtree Street in Downtown to construct a platform over the highway, extending from the Civic Center MARTA station at West Peachtree Street to Piedmont Avenue. A key focal point of The Stitch concept design is improving what is currently the Civic Center MARTA station by creating a dynamic urban plaza coined “Emory Square.” The Emory Square plaza would connect St. Luke’s Episcopal Church on the west to a re-imagined Emory Square MARTA station, as well as to Emory’s future “Medical Arts Institute” building and to new retail and residential areas. Spanning the Downtown Connector, northeast of the Peachtree Street and Ralph McGill Blvd intersection, would be “Peachtree Green.” This new 3-acre urban green space would feature active program elements on all sides including water features, a restaurant and café, a pavilion space for markets and art shows, an art walk, a “Mayor’s Walk,” and a civic heroes memorial. “Energy Park,” an urban park surrounded by new mixed-use residential, continues the thread of reclaimed open space throughout The Stitch to the southeast from Peachtree Green to a new Gateway Pavilion at the Piedmont Ave and Baker Street intersection. Energy Park would feature lawns, a dog park, a playground, water features, a splash pad, a flex-use pavilion, and a garden walk. Its location next to Georgia Power’s headquarters also provides opportunities to demonstrate innovative green construction and power technologies. While ambitious, The Stitch is not unlike other projects recently completed around the country to reclaim and re-stitch large segments of urban areas that were fragmented by urban highway development. Costs to complete this transformative project are estimated, based on similar per acre costs for projects recently completed in both Dallas and Philadelphia, at approximately $300 million. It is also estimated that The Stitch could result in $1.1 to $3.1 billion in value creation, generate $21 to $58 million in new revenue, and increase the city’s bonding capacity by $308 to $847 billion by increasing the value of existing properties and catalyzing the redevelopment of underutilized properties. If you have questions or need more information about The Stitch, contact Audrey Leous at aleous at atlantadowntown.com or 404-658-5911.